An ant infestation can be annoying for the average homeowner, but there are other ant species which can be devastating to those who are in the agricultural industry or growing a garden. One particular ant that can be a threat to plant life is Leafcutter Ant. Leaf cutter ants get their name due to their habit of cutting into leaves and carrying pieces of leaves around. Leafcutter ants are known to damage residential areas but are also considered an agricultural pest and do a lot of damage to vegetation when they infest areas in heavy numbers. High populations of leaf cutter ants have the ability to defoliate plants in the span of a day and have lead to annual decreases in plant yield, affecting the agricultural economy. Leafcutter ants prefer to live in warm areas, and unlike other species of ants, leafcutter ants cultivate and feed on fungus within their nests. While leaf cutter ants are usually a problem in rural and agricultural areas they can also travel to urban areas and be a problem for homeowners because of their ability to rapidly defoliate lawns and gardens. Leaf cutting ants damage weeds, grasses, fruit trees, blackberry bushes and much other fruit, nut, and ornamental plants as well as several grain and forage crops. Leaf cutter ants are often regarded as the planets first farmers. What’s surprising about the leaf cutter ant is that they actually don’t eat the leaves they cut down. In fact, they use them to grow a fungus garden which becomes both their food and living space. They keep their fungus garden well maintained with bacteria on their body. 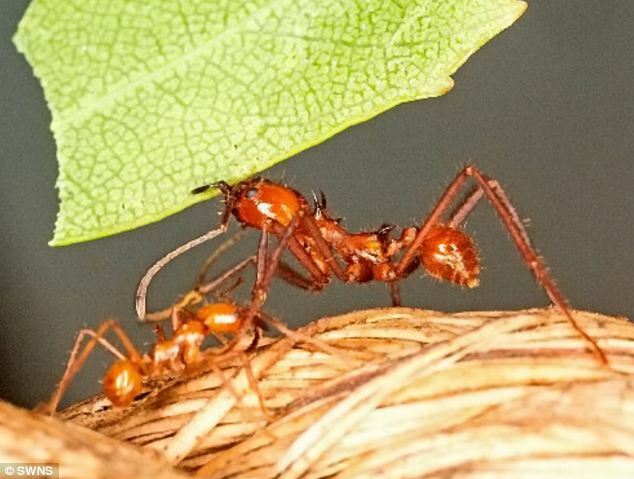 Bacteria on the body of a leaf-cutter ant keep harmful microbes from damaging the fungus. Wherever leaf cutting ants are plentiful, it can be nearly impossible for plantlife to grow and survive because of how efficient they are in tearing down plants, grasses, and other foliage. More than a million of the tropical insects – who can carry 20 times their weight in their jaws – had been living at Butterfly World near St Albans, Hertfordshire. They were dominated by a giant queen ant, the size of a small mouse, who was protected by an inner circle of soldier ants. But in recent weeks, some of the ants had started nibbling on a power lead in their glass cabinet, which was linked to a water tank regulating their temperature. They finally bit through the lead and sent an electric current shooting through the colony – killing the queen and her soldier guards. Most of the worker ants escaped the shock as they were in a separate part of the enclosure cutting leaves. But carnage erupted when they returned to find the queen and her inner circle dead. Without a queen to protect, fighting broke out and the leaderless ants started dying in huge numbers as they killed each other or starved to death. Leafcutter ants can be a huge pain when it comes to your house’s landscape and foundation. Merchant said that though the leafcutter ant has yet to become a widespread problem in the Dallas metroplex area, it has been a problem for homeowners in east, south and central Texas. “Their large colony sizes, impressive soil excavating power and destructive potential against plants makes them a serious pest,” said Merchant, who is based at the Texas A&M University System Agricultural Research and Extension Center in Dallas. Not only do leafcutter ants strip landscape foliage of leaves, they create huge underground storage vaults for the leaves they gather. They don’t actually eat the leaves, but use them in a form of ant agriculture, inoculating the leaves with a fungus. The fungus eats the leaves; the ants eat the fungus. Though vegetarian ants may sound charming, in the process of excavating, they can cause both sunken areas in lawns and create large unsightly mounds. On many occasions, they have reportedly tunneled under house slabs and cause them to crack, Merchant said. 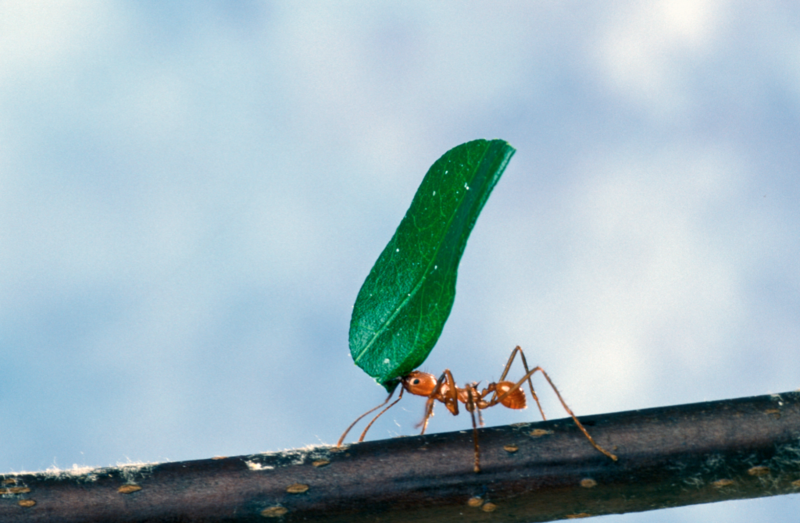 Control of leafcutter ants used to be fairly straight-forward with a bait product called Volcano, Merchant said. Because these ants eat only the fungus they cultivate, they do not respond to most conventional ant baits, such as those labeled for fire ants. So what can be used efficiently to keep the leafcutter ants away from your plants? C Tech Corporation offers a range of low toxic and low hazard insect aversive repellent, which can be successfully used to keep pesky creatures at bay. Combirepel™ can be easily described as insect aversive repellent, used also against all types of insects and which works on the mechanism of repellency. It means that it does not kill the target insects but only repel them, thus balancing the ecology and helping in maintaining the goal of sustainability. This product can be easily used against a number of insects. The product available in the form of masterbatch can be incorporated into the base polymer of applications like the wire and cables, pipes, agricultural films, and mulches, irrigation pipes, etc. The lacquer can be applied as a topical application on the fence, wooden objects, furniture, ceilings, frames, etc. CombirepelTM liquid concentrate can be diluted in paints in a pre-determined ratio can be applied on walls and many other end applications to keep the leafcutter ants away from homes, gardens and farms. CombirepelTM pest repellent spray can be sprayed on infested and susceptible areas to keep them away from the application. Combirepel™ is thermally stable and does not degrade on exposure to heat and sunlight. It does not kill or harm the insect but repels them. It does not volatilize and does not degrade the soil. It is RoHS, RoHS2, ISO, EU BPR, REACH, APVMA, NEA compliant and FIFRA exempted.